Cupping (hijama) is the best remedy recommended and used by the Messenger (Sallallaahu Álayhi Wasallam). The Messenger (Sallallaahu Álayhi Wasallam) said, "Indeed the best of remedies you have is cupping (hijama)…" [Saheeh al-Bukhaaree (5371)]. He (Sallallaahu Álayhi Wasallam) also said: that on the night of Israa (his ascension to the heavens) he (Sallallaahu Álayhi Wasallam) did not pass by an angel except that it said to him, "Oh Muhammad, order your Ummah (nation) with cupping (hijama)." [Saheeh Sunan Tirmidhee (3479)]. This shows the importance and greatness of this Sunnah. * Dry cupping (hijama) - This is the process of using a vacuum on different areas of the body in order to gather the blood in that area without incisions (small, light scratches using a sterile surgical blade or disinfected razor). * Dry massage cupping (hijama) – This is similar to dry cupping (hijama) but olive oil is applied to the skin (before applying the cups) in order to allow easy movement of the cups. The Messenger (Sallallaahu Álayhi Wasallam) said, "For every disease there is a cure so if the medicine comes upon the disease it cures it by the will of Allah, the Most High." [Saheeh Muslim (2204)]. * Wet cupping (hijama) - This is the process of using a vacuum at different points on the body but with incisions in order to remove 'harmful' blood which lies just beneath the surface of the skin. 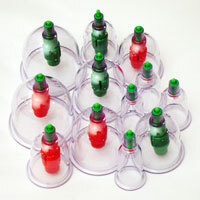 (It is recommended that wet cupping (hijama) is only administered by a cupping therapist). Cupping (hijama) is a cure for every disease if performed in its correct time. The Messenger (Sallallaahu Álayhi Wasallam) said, "Indeed in cupping (hijama) there is a cure." [Saheeh Muslim (5706)]. The Messenger (Sallallaahu Álayhi Wasallam) said, "Whoever performs cupping (hijama) on the 17th, 19th or 21st day (of the Islamic, lunar month) then it is a cure for every disease." [Saheeh Sunan abi Dawud (3861)]. Above are just some of the authentic narrations which show that cupping (hijama) is from the Sunnah of the Messenger (Sallallaahu Álayhi Wasallam). The Messenger (Sallallaahu Álayhi Wasallam) said, "Whoever revives a Sunnah from my Sunnah and the people practise it, she/he will have the same reward of those who practise it without their reward diminishing…" [Sunan ibn Maajah (209)]. Anas ibn Maalik (may Allah be pleased with him) reported that the Messenger (Sallallaahu Álayhi Wasallam) said, "Indeed the best of remedies you have is cupping (hijama)…" [Saheeh al-Bukhaaree (5371)]. Abu Hurairah (may Allah be pleased with him) reported that the Messenger (Sallallaahu Álayhi Wasallam) said, "If there was something excellent to be used as a remedy then it is cupping (hijama)." [Saheeh Sunan abi Dawud (3857), Saheeh Sunan ibn Maajah (3476)]. Abdullah ibn Abbas (may Allah be pleased with him) reported that the Messenger (Sallallaahu Álayhi Wasallam) said, "I did not pass by an angel from the angels on the night journey except that they all said to me: Upon you is cupping (hijama), O Muhammad." [Saheeh Sunan ibn Maajah (3477)]. In the narration reported by Abdullah ibn Mas'ud (may Allah be pleased with him) the angels said, "Oh Muhammad, order your Ummah (nation) with cupping (hijama)." [Saheeh Sunan Tirmidhee (3479)]. Anas ibn Maalik (may Allah be pleased with him) reported that the Messenger (Sallallaahu Álayhi Wasallam) said, "Whoever wants to perform cupping (hijama) then let him search for the 17th, 19th and 21st day (of the Islamic, lunar month) and let none of you allow his blood to rage (boil) such that it kills him." [Saheeh Sunan ibn Maajah (3486)]. Anas ibn Maalik (may Allah be pleased with him) reported that the Messenger (Sallallaahu Álayhi Wasallam) said, "When the weather becomes extremely hot, seek aid in cupping (hijama). Do not allow your blood to rage (boil) such that it kills you." [Reported by Hakim in his 'Mustadrak' and he authenticated it and Imam ad-Dhahabi agreed (4/212)]. Abdullah ibn Abbas (may Allah be pleased with him) reported that the Messenger (Sallallaahu Álayhi Wasallam) said, "Healing is in three things: in the incision of the cupper, in drinking honey, and in cauterizing with fire, but I forbid my Ummah (nation) from cauterization (branding with fire)." [Saheeh al-Bukhaaree (5681), Saheeh Sunan ibn Maajah (3491)]. Jaabir ibn Abdullah (may Allah be pleased with him) reported that the Messenger (Sallallaahu Álayhi Wasallam) said, "Indeed in cupping (hijama) there is a cure." [Saheeh Muslim (5706)]. Ibn Umar (may Allaah be pleased with him) reported that the Messenger (Sallallaahu Álayhi Wasallam) said, "Cupping (hijama) on an empty stomach* is best. In it is a cure and a blessing..." [Saheeh Sunan ibn Maajah (3487)]. Abu Hurairah (may Allah be pleased with him) reported that the Messenger (Sallallaahu Álayhi Wasallam) said, "Whoever performs cupping (hijama) on the 17th, 19th or 21st day (of the Islamic, lunar month) then it is a cure for every disease." [Saheeh Sunan abi Dawud (3861)]. The best days for cupping (hijama) are the 17th, 19th and 21st of the Islamic, lunar month which coincide with Monday, Tuesday or Thursday. Anas ibn Maalik (may Allah be pleased with him) reported that the Messenger (Sallallaahu Álayhi Wasallam) said, "Whoever wants to perform cupping (hijama) then let him search for the 17th, 19th and 21st…" [Saheeh Sunan ibn Maajah (3486)]. Ibn Umar (may Allah be pleased with him) reported that the Messenger (Sallallaahu Álayhi Wasallam) said, "Cupping (hijama) on an empty stomach* is best. In it is a cure and a blessing. It improves the intellect and the memory. So cup yourselves with the blessing of Allah on Thursday. Keep away from cupping (hijama) on Wednesday, Friday, Saturday and Sunday to be safe. Perform cupping (hijama) on Monday and Tuesday for it is the day that Allah saved Ayoub from a trial. He was inflicted with the trial on Wednesday. You will not find leprosy except (by being cupped) on Wednesday or Wednesday night." [Saheeh Sunan ibn Maajah (3487)]. Ibn Umar (may Allah be pleased with him) reported that the Messenger (Sallallaahu Álayhi Wasallam) said, "Cupping (hijama) on an empty stomach* is best. It increases the intellect and improves the memory. It improves the memory of the one memorising. So whoever is going to be cupped then (let it be) on a Thursday in the name of Allah. Keep away from being cupped on a Friday, Saturday and Sunday. Be cupped on a Monday or Tuesday. Do not be cupped on a Wednesday because it is the day that Ayoub was befallen with a trial. You will not find leprosy except (by being cupped) on Wednesday or Wednesday night." [Saheeh Sunan ibn Maajah (3488)]. The Sunnah days for cupping (hijama) every month are when the 17th, 19th or 21st of the Islamic, lunar month coincide with a Monday, Tuesday or Thursday. These are the best and most beneficial days for cupping (hijama). If one is not able to be cupped on the 17th, 19th or 21st (coinciding with Monday, Tuesday or Thursday) then any Monday, Tuesday or Thursday of the month. The most beneficial days for cupping (hijama) after the Sunnah days are the closest Monday, Tuesday or Thursday to the 17th, 19th or 21st of the Islamic, lunar month and Allah knows best. Salma (may Allah be pleased with him), the servant of the Messenger of Allaah (Sallallaahu Álayhi Wasallam) said, "Whenever someone would complain of a headache to the Messenger of Allah (Sallallaahu Álayhi Wasallam), he (Sallallaahu Álayhi Wasallam) would advise them to perform cupping (hijama)." [Saheeh Sunan abi Dawud (3858)]. Ibn al-Qaiyum (may Allah have mercy on him) mentions that the Messenger (Sallallaahu Álayhi Wasallam) was cupped on his head when he was afflicted with magic and that it is from the best of cures for this if performed correctly. [Zaad al Ma'aad (4/125-126)]. Abdullah ibn Abbas (may Allah be pleased with him) reported: that a Jewish woman gave poisoned meat to the Messenger of Allah (Sallallaahu Álayhi Wasallam) so he (Sallallaahu Álayhi Wasallam) sent her a message saying, "What caused you to do that?" She replied, "If you really are a Prophet then Allah will inform you of it and if you are not then I would save the people from you!" When the Messenger (Sallallaahu Álayhi Wasallam) felt pain from it, he (Sallallaahu Álayhi Wasallam) performed cupping (hijama). Once he travelled while in Ihram and felt that pain and hence performed cupping (hijama). [Ahmed (1/305) the hadeeth is hasan (good chain with all the paths)]. Ibn Umar (may Allaah be pleased with him) reported that the Messenger (Sallallaahu Álayhi Wasallam) said, "Cupping (hijama) on an empty stomach* is best. In it is a cure and a blessing. It improves the intellect and the memory..." [Saheeh Sunan ibn Maajah (3487)]. Jaabir ibn Abdullah (may Allah be pleased with him) reported that the Messenger (Sallallaahu Álayhi Wasallam) fell from his horse onto the trunk of a palm tree and dislocated his foot. Waki' (may Allaah be pleased with him) said, "Meaning the Messenger (Sallallaahu Álayhi Wasallam) was cupped on (his foot) for bruising." [Saheeh Sunan ibn Maajah (2807)]. Abdullah ibn Abbas (may Allah be pleased with him) reported that the Messenger (Sallallaahu Álayhi Wasallam) was cupped on his head for a unilateral headache while he was in Ihraam. [Saheeh al-Bukhaaree (5701)]. Abdullah ibn Abbas (may Allah be pleased with him) reported that the Messenger (Sallallaahu Álayhi Wasallam) was cupped while he was fasting. [Saheeh al-Bukhaaree (5694)]. Anas ibn Maalik (may Allaah be pleased with him) was asked: "Did you dislike cupping for the fasting person?" He said, "No except for the reason of one becoming weak." [Saheeh al-Bukhaaree (1940)]. Abu Sa'eed al-Khudhree (may Allah be pleased with him) said, "The Messenger (Sallallaahu Álayhi Wasallam) validated cupping for the fasting person." [Saheeh see Irwaa al-Ghaleel (4/74)]. It appears that cupping (hijama) is allowed but disliked as Anas ibn Maalik (may Allah be pleased with him) mentioned because the fasting person becomes weak if they perform cupping (hijama) and Allah knows best. Abdullah ibn Abbas (may Allah be pleased with him) reported that the Messenger (Sallallaahu Álayhi Wasallam) was cupped on his head. [Saheeh al-Bukhaaree (5699)]. Abdullah ibn 'Umar (may Allah be pleased with him) reported that the Messenger (Sallallaahu Álayhi Wasallam) used to cup his head and would call it (the place at the top of the head) "Umm Mugheeth." [Saheehah (753), Saheeh al-Jaami' (4804)]. Jaabir ibn Abdullah (may Allah be pleased with him) reported that the Messenger (Sallallaahu Álayhi Wasallam) was treated with cupping (hijama) on his hip for a pain in that area. [Saheeh Sunan abi Dawud (3863)]. Anas ibn Maalik (may Allah be pleased with him) reported that the Messenger (Sallallaahu Álayhi Wasallam) was treated with cupping (hijama) when he was in Ihram, on the top of his foot, for a pain in that area. [Saheeh Sunan abi Dawud (1836)]. Ibn al-Qayyim (may Allah have mercy on him) said, "Cupping (hijama) under the chin is beneficial for pain in the teeth, face and throat, if it is performed in its proper time. It purifies the head and the jaws. Jaabir ibn Abdullah (may Allah be pleased with him) reported Umm Salama (may Allah be pleased with her) asked permission from the Messenger (Sallallaahu Álayhi Wasallam) to be treated with cupping (hijama). So the Messenger (Sallallaahu Álayhi Wasallam) ordered Abu Teeba (may Allah be pleased with him) to cup her. Jaabir ibn Abdullah (may Allah be pleased with him) said, " I think he (Sallallaahu Álayhi Wasallam) said that Abu Teeba (may Allah be pleased with him) is her brother through breastfeeding or a young boy who didn't reach puberty". [Saheeh Muslim (5708), abu Dawud (4102), Saheeh ibn Maajah (3480)].